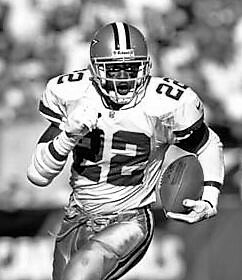 Emmitt Smith, Former Football Running Back. Superbowl Champion. Business and Leadership Speaker. Currently, Smith has transitioned to the role of businessman and entrepreneur, and runs several companies spanning real estate, construction and technology. He is also a Certified Commercial Investment Member (CCIM) and REALTOR®. Current businesses include: ESmith Legacy, a premier real estate development and asset management firm; EJ Smith Construction, a Dallas-based commercial and civil construction manager and general contractor; E Smith Capital Partners, specialists in the procurement of commercial real estate equity and debt financing; and PROVA Group, Inc., a digital authentication company.